Ian Fox’s talk was at 2.30 in the Music Room at Christ Church, Cheltenham. 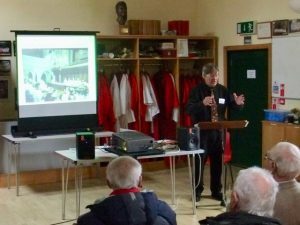 The talk was illustrated by pictures and recordings of his time at Cranleigh Preparatory School, Cathedral Assistant Organist at Chichester Cathedral including playing for BBC Wednesday Choral Evensongs and his many experiences as accompanist and organist, some of them hilarious, both at home and abroad. There was good attendance at this event and many memories were recalled by members. Ian was educated at Bedford School and showed photographs of the school and the organ, which had a model train running above the music desk; the train moved up and down the line as the wind was used from the organ reservoir. With Forster and Andrews pipes, Ian built a small organ at his home where the blower was a vacuum cleaner in reverse. The hoover.was so loud that it had to be placed in the next room with the air duct through a hole in the window. Later on, a Mark II version of the same organ used more conventional blowing and this was illustrated by a recording of part of a Handel Organ Concerto. After Oxford and a Reading and Ian’s first teaching post at Cranleigh Preparatory School Ian became Assistant Organist of Chichester Cathedral in 1972 until 1978, where the Organist was John Birch. The picture is one of the slides shown during Ian’s talk. 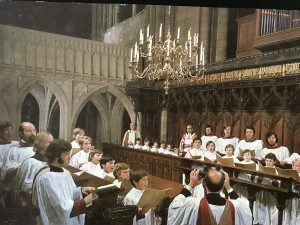 It Shows Chichester Cathedral Choir circa.1976 with John Birch conducting. By pressing the white triangle on the left hand side of the long strip, you can hear part of Walmisley’s anthem.00:04 “Remember O Lord What Is Come Upon Us” sung by the tenors and basses of the choir. This was shown and played during the talk. The music was of a high standard at Chichester and there were some notable solo voices. One of these was the treble Andrew Wicks who is now a professional tenor. Andrew was heard in a recording of Mozart’s “Alleluia” and in the Magnificat in G by Stanford for a BBC broadcast. Waiting to play the introduction when the first lesson finished was one of the Ian’s most nerve-wracking experiences. For the annual Southern Cathedrals Festival in Salisbury, we stayed in the city’s Theological College. 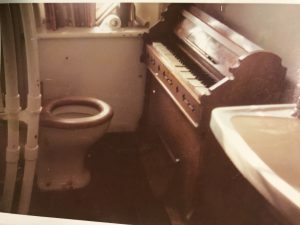 The only place where they could accommodate a harmonium was in the wash-room and you had to sit on the toilet to play it. Tim Ingold thanked Ian on behalf of the members present for an amusing and interesting talk that was well illustrated with a large screen and a good sound system. We also thank Mike Eddy and Keith Lamb for serving refreshments after the meeting.6.